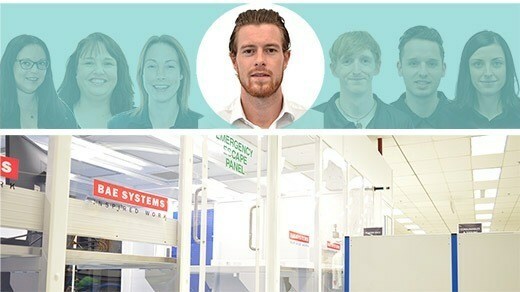 In this blog post, Josh Haston, our Territory Account Manager in the Mid-West, discusses the impact of Nadcap (National Aerospace and Defense Contractors Accreditation Program) on the design and build of cleanrooms. As an integrated cleanroom solutions provider, in 16 years, Connect 2 Cleanrooms have become a trusted partner to over 6000 customers worldwide. Within the scope of the business, the Territory Account Managers support in the design, installation and validation of cleanroom solutions across the globe. The main aim of our role as Territory Account Managers is to understand our customers’ requirements and how our solutions can benefit the specific needs of their business and operation. Due to the diversity of designs available, we cover a vast range of customers across many business sectors which makes it important to have a broad knowledge base. Within our customer base we support a number of automotive, aerospace, and composite manufacturers; such as BAE Systems, AIM Composites and Rolls Royce. Often within these industries our partners will be required to follow strict guidelines in how their products are manufactured, and the facilities in which they are manufacturing. Nadcap is aimed at generating a continual improvement programme for businesses within the Aerospace manufacturing and defence industries. Nadcap accreditation leads to a standardised approach to quality assurance, meaning that a standard process can be followed. Requires fewer audits for suppliers. How can Connect 2 Cleanrooms help? Outlined within the criteria is a CCA (Controlled Contamination Environment) section, which details guidelines for the design and structure of a cleanroom in order for organisations to manage their operation effectively. Throughout the cleanroom initial requirements meeting and design phase we will work closely with organisations who are looking to be Nadcap compliant, ensuring that their cleanroom facility incorporates the guideline requirements. We’d love to talk to you about where we can support your specific cleanroom requirements. Contact us, to start discussing your project today! Bent u gereed om een project met ons te realiseren? Neem dan nu contact met ons op!